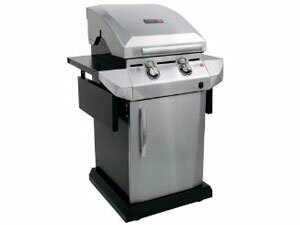 It comes with modern technology for a perfect grilling experience. Engineered by Char- broil, makes it an amazing product. The barbecue produces infrared heat that is at least sixty-five percent that is uniformly distributed across the whole grilling floor, to grill your food without causing it to dry, as well as at temps which vary from simmer to sear. This two burner barbecue is very efficient because of the distinctive infrared grates that are patented branded; therefore, it requires only two burners to finish your cooking job with the small area of grilling. It has a warranty of one year and a lifetime warranty for the burners. It grills fish, meat and even vegetables perfectly, leaving the inside moist and also yummy. The heat is equally distributed and does not have flare ups. This enables the meat on the grill to cook evenly. It also heats quickly and is capable of grilling a steak in about 15 minutes. The grill is ideal for 1to2 people. It also has a small size; as a result, it can fit on a smaller patio. The instructions are well written, making it easy to put together. This grill requires high maintenance, as the infrared grates need cleaning after every use because of the small drain holes, and also a high temperature burn is necessary after every grilling to burn off oil. Seasonings, salts put in meats and marinades in the meats make the grates begin to rust after a few years. Additionally, the holes on the burners begin to rust along with the holes getting blocked as a result of food droppings. There is also rust scale inside the burners that might block the flame exit openings. The welded handle can break off, which makes it impossible to fix without getting a new handle and also two end cap parts. Grilling is an activity that is loved by many people. With the Char-Broil TRU Infrared Urban Gas Grill with Folding Side Shelves, you can be assured that your food will be cooked to perfection. The grill will satisfy all your needs and those close to you as it will produce the best meals ever.